Helí Garcia lives and works in Granada, Spain, where he was born (1983) and began his artistic training. 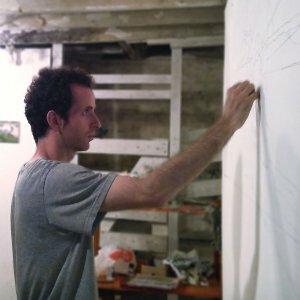 On completing his Degree in Fine Arts from the University of Granada and the Akademia Sztuk Pieknych in Poznan (Poland), he has been fully committed to creating and exhibiting new works; with shows across Europe and support from many different cultural institutions. The practice of painting has been integral to his career, but he is open to other areas consistent with his understanding of artistic expression, free and not limited by logistical, technological or bureaucratic constraints. Marked by the direct and immediate treatment of the material, his work is a dual look at the global and the personal. This leads again and again to issues relating to the role of the individual-creator in society and in nature. Allusions to concepts such as power, vanity, time or innocence are plentiful in a discourse full of ironic overtones.